At the 'Business, Innovation and Community Event' in Singapore where digital platform was the main feature, PM Modi launched BHIM, RuPay and SBI app. Industry observers say the launch would create multi-billion dollar transactions. Singapore: Prime Minister Narendra Modi today launched three Indian mobile payment apps in Singapore at a business event aimed at globalization of the country's digital payment platform. 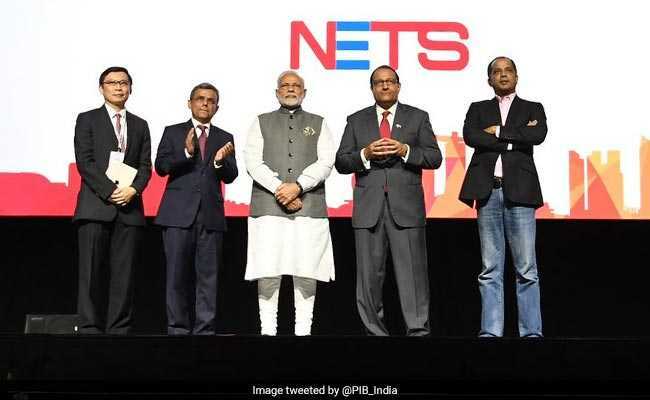 At the 'Business, Innovation and Community Event' in Singapore where digital platform was the main feature, PM Modi launched India's BHIM, RuPay and SBI app. India's RuPay digital payments system was linked to Singapore's 33-year old Network for Electronic Transfers (NETS). RuPay users will be able to make payments at all of NETS acceptance points across Singapore. Holders of Singapore NETS will be able to make online purchase on any National Payment Corporation of India (NPCI) e-commerce merchant website in India, using 2.8 million RuPay point of sale terminals in India. Industry observers said it would create multi-billion dollar transactions as some five million Indians travel to and transit through Singapore, internationalizing the RuPay beginning with the first cross border usage. Also, a new app-based rupee remittance mode of the SBI's Singapore branch was launched at the event. "In order to expand our remittance offering, we are launching rupee remittance to India through United Payment Interface (UPI)," SBI country head in Singapore, Soma Sankara Prasad, said today after the launch at the event where digital platform was the main feature. Singapore branch of the SBI is the first to launch this new mode of remittance in collaboration with National Payment Corporation of India (NPCI). "This is a major step towards the internationalization of India's digital payment platform," Mr Prasad said. It will be most convenient for Indian blue-collar workers in Singapore to use the app for sending money home from their dormitories at work sites, he said. SBI has six branches in Singapore as well as Auto Teller Machines (ATMs). PM Modi began his Singapore tour with a visit to the India-Singapore Enterprise and Innovation Exhibitions. The Centre showcased technological innovations including artificial intelligence, fin-tech and innovation for social impact.